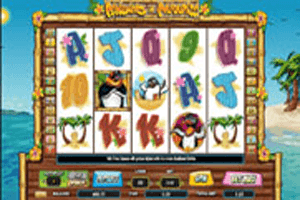 Penguins in Paradise slot game lets you enjoy a tropical themed gaming experience that will take you to the most relaxing and entertaining tropical islands where you will get to accompany a group of penguins who are enjoying paradise. So pack your bags, get our swimsuit and your sun lotion and get ready to enjoy the water and the sand with this beautiful 25-reeled video slot machine that is brought to you courtesy of Cryptologic. Being a Cryptologic slot means that players can expect to enjoy a one of a kind gaming experience that is offered in great visuals and amazing sound effects that create the immersive tropical environment, this way, players can travel to this amazing place from the comfort of their own houses. Play the Penguins in Paradise free slots game. The interface is dominated by the theme, this is why players will notice that the reels of the game are located on the sandy beach and the water as players can see all of that in the background and the sun at the very top. The reels themselves are outlined by bamboo sticks and the symbols that appear on the reels are all inspired by that theme. These symbols include a big smiling penguin, a baby penguin building a sand castle, two palm trees, a hot female penguin, a soft drink with a fish in it, a wooden mask and card symbols. These symbols appear on the 5 reels and the 25 betting lines. The Cryptologic game is pretty rewarding as players can either earn great payouts by placing bets on the lines and getting winning combos on them or through the help of the special symbols and through the bonus features that the game holds. Starting with the line payouts, players will get paid when they get a minimum of three matching symbols from the left to the right on any of the activated bet lines. The highest payout is equal 5000 coins which is given to players when they get 5 of the highest paying symbol, the big male penguin on an activated line. Other symbols, depending on how many of them are in the combo, pay players from 5 to 1000 coins. The highest paying symbol is also the games wild symbol. This means that the symbols will help players increase their winning chance as it has the ability to substitute for any of the other symbols, with the exception of the other bonus symbol, the fish drink. Speaking of which, the Fish Drink is the scatter symbol that can pay players from left to right and from right to left. On top of that, it is the bonus symbol that can trigger the Free Games features. On top of that, there is also a bonus round in which players will perform tricks in front of a panel of penguin judges in chances of getting rewards. The higher the score that players achieve, the higher the payout will become.